I just discovered the online magazine foodiecrush and I love it. 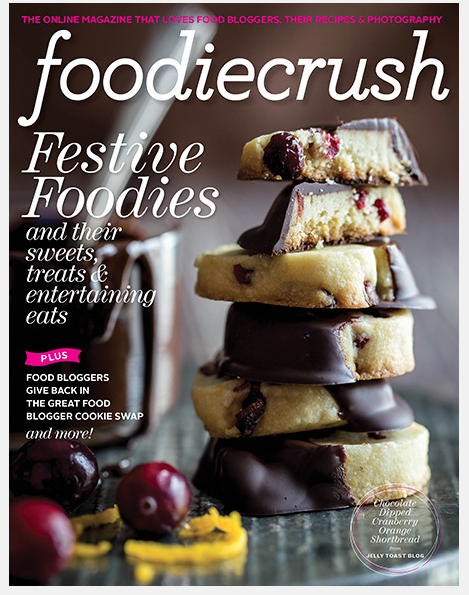 Check out their Holiday 2013 edition, which features "Festive Foodies and their Sweets, Treats and Entertaining Eats." My holiday spirit took a major hit while I dealt with the flu all week. As soon and I'm back to a normal human temperature, I'm going to try Darling Magazine's list of Top 5 Ways to Get into the Holiday Spirit. Hot cocoa and cookies sound SO much more appealing than vegetable broth and Emergen-c.
Lark & Linen interviews Martha Stewart for her holiday entertaining tips. An invitation to Martha's annual Christmas Brunch Open House is on my (in my wildest dreams) wish list. Cookies you can make out of leftover pie crust - no more waste! Getting a little tired of the non-stop promotional emails from every single company who has your address? This 2013 Hater's Guide to the Williams-Sonoma Catalog will make it all better.